Every year, people from all over Europe and and North America travel to Northern Italy to enjoy its amazing mountains: the Alps. The Alps are home to some of the best ski resorts and most picturesque towns in the world. There are plenty of winter sports to practice and you can choose from a number of locations to enjoy skiing activities. If you would like to mix culture and skiing, you could choose Piemonte and spend some time in Turin before heading to the mountains: the city played host to the Winter Olympics in 2006 along with the Val di Susa, which is only a stone’s throw from the city. Skiing in Italy can be really adventurous and it is an experience that goes easy on the eye. There are not many places as beautiful as the Alps and this is a factor certainly attracting more and more tourists to our mountains every year. Another positive point about choosing Italy for your skiing vacations is the variety of resorts the country has to offer: there is something for all pockets, for families, young and old skiers. As for any touristic location, planning and booking well in advance can help you save a few dollars, even if you want to visit one of the high end resorts. Cortina d’ Ampezzo is one of the most popular ski resorts, well known for being a favorite destination for Italy’s rich and famous. The town turned into a skiing hub some 160 years ago, when it became a popular place to start tours of the Dolomites. The town and its slopes have been the stage of many international sporting events, such as the Winter Olympics in 1956, and it is regularly part of the Skiing World Cup every year. It is also often see of cross country marathons and competitions. 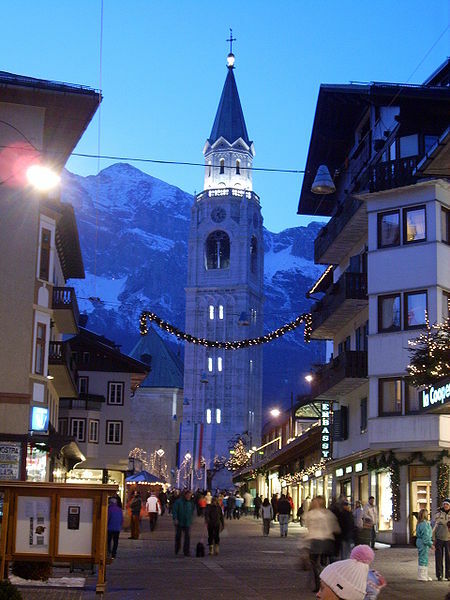 For its beauty and charm, Cortina has gained the nickname of Queen of the Dolomites. Well loved and appreciated by skiers all over the world, Madonna di Campiglio is situated in the Gruppo del Brenta section of the Dolomites. It is part of a large skiing conglomerate, the Skirama, which also includes several others ski resorts such as those of the Passo del Tonale and of the Presena Glacier. If Cortina is called the Queen of the Dolomites, Madonna di Campiglio is certainly their Pearl. One of the most prestigious ski resorts of the country, Cervinia, just like Cortina D’Ampezzo, is a darling of Italy’s and Europe’s VIPs. Located near the Italo-Swiss border, Cervinia is one of the highest skiing resorts of Europe and it is open for winter sports during the summer months. Cervinia enjoys, then, a summer season, that runs from June to September, and a regular winter season, from the end of October to late April. Bormio is the ideal place to go if you are a beginner and would like to get a taste of old fashioned Europe, as well as learn how to ski. Bormio is a charming village located in Lombardy, surrounded by some of the most amazing Alpine peaks. It is the perfect location for a family holiday, with easy slopes on which to practice and learn. It may not be the best choice, however, if you are a pro, as its slopes may not be adventurous enough for a seasoned skier. If you want to enjoy a short ski holiday, then Sestriere is a good place to have some fun and enjoy skiing activities. It is suitable for both beginners and intermediate skiers, and it is particularly popular among snowboarders. Besides, it hosts lots of sporting events and activities such as the Alpine Ski World Cup and World Championships, so if you end up there in the right time of the year, you may set yourself up to meet ski royalty! The Arabba skiing complex includes all skiing areas of the Marmolada, where you can ski during the summer, as well as the winter. The Marmolada glacier provides a link to the well known Sella Ronda. The Arabba skiing complex offers the possibility to use a series of ski lifts connecting several slopes across different mountains and valleys: an amazing opportunity to get to know this fantastic area and immerse yourself in nature. The villages in the area are particularly charming and will offer a perfect location to enjoy your time off the slopes. Thanks to the altitude of the resort, the Passo del Tonale offers good snow for a relatively long time each year. Some of its slopes are particularly good for beginners, as they are shorter and not as difficult as one may expect. For this reason, the Passo del Tonale is ideal for families, or even for skiing school trips. It is pocket friendly, too, which makes all the difference if you are trying to organize a family trip on a bit of a budget. Located at a height of 1,563 metres above sea level, Selva di Valgardena is considered one of the best skiing destination in the country; it is also an amazing place to visit during the summer if you are a trekking and mountaineering lover. It is beautifully located at the foot of the Sella Massif and is easily connected to the Sella Ronda. The Val di Fiemme offers a range of skiing activities: snowboarding, night skiing and ice-skating. Many other facilities are available for the enjoyment of your holiday, even if you are not too keen on skiing. Just as the majority of the resorts presented above, the valley is located in the Dolomites, considered one of UNESCO patrimony of Mankind. Visit this place to have lot of fun and entertainment and get involved in a range of activities offered in its ski resorts and villages. Let us move from the eastern to the western Alps and take a trip to Valle d’Aosta, where Gressoney is. This ski resort is well known because of its location at the feet of the Monte Rosa, the second highest mountain in Europe. As you can see, Italy offers numerous options if you decide to visit during the winter and try winter sports. The resorts and locations presented above are only a small fraction of the many, beautiful places in the Alps where you can enjoy skiing and get a taste of Italian life at the same time. Use this page as a guide to our mountains, but do not limit your search to these particular locations. Discover your own Queen of the Alps, and drop us a line when you do, let us know about it!